Description: This colorful, elegant, flat photo card is available with your photograph printed right on the card, along with your message and names. You choose your greeting and ink color and your recipients will be delighted with your card this year! Price includes up to 8 lines of copy. 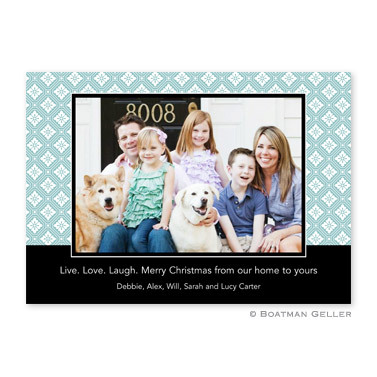 Card is 5" x 7" and available with digital picture printed on the card. Most designs have matching return address and gift stickers. And for an especially nice touch to your holiday photo cards, add an envelope lining in a matching or coordinating design/color (Liner Options: jungle, raspberry, navy, cornflower, cherry, midnight, kelly, mocha, lime, chocolate, tangerine, pine, slate, cranberry, gray, turquoise, plaid red, black watch plaid, swiss dot red, swiss dot pine, swiss dot teal, damask white & black, damask chocolate, damask cranberry).